Luke Perry and Jason Priestley worked together on the legendary 90's TV show "Beverly Hills, 90210," and in this acclaimed Western which premiered on the Hallmark Channel in January 2011, they reunite for the very first time with Priestley behind the camera and Perry in the lead role. Entertainment One presents Goodnight for Justice , coming to DVD April 12th! Luke Perry and Jason Priestley worked together on the legendary 90's TV show "Beverly Hills, 90210," and in Goodnight for Justice , an acclaimed Western which premiered on the Hallmark Channel in January 2011, they reunite for the very first time with Priestley behind the camera and Perry in the lead role. John Goodnight (Perry) has a crystal clear memory of the day that his family fell victim to ruthless outlaws. Years later, after he's named a circuit judge of the Western Territories, Goodnight must choose between justice and revenge when the same outlaws return to terrorize his lands. 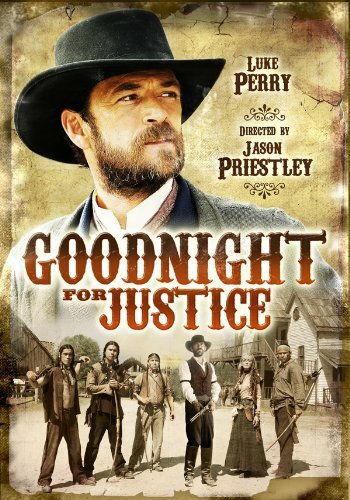 Luke Perry and Jason Priestley last worked together on the legendary 90's teen soap "Beverly Hills, 90210," but in Goodnight for Justice , an acclaimed Western which premiered on the Hallmark Channel in January 2011 they reunite for the very first time with Priestley behind the camera and Perry in the lead. John Goodnight (Perry) has a crystal clear memory of the day that his family fell victim to ruthless outlaws. He and the wife of Circuit Judge Aldous Shaw were the only survivors of the attack; she would become his foster mother. Goodnight cannot forget the corrupt man who destroyed his family and he lives for a second chance encounter with the outlaw. Years later, after he's named a circuit judge of the Western Territories, Goodnight must choose between justice and revenge when the same outlaws return to terrorize his lands.